Last week I cried as a sweet, peaceful, loving dog stopped breathing in my arms. Then I cried tears of joy, as I watched him come back to life. I’d traveled that day to Sheepshead Bay to work with a Presa Canario named Tyson. I approached this meeting cautiously: this “Canary” strain of Mastiff is notoriously one of the biggest and strongest; Tyson himself had had no prior training, and was unneutered. Add his cropped “fighting” ears to the picture and you’ve got one pretty reliable mugging-deterrant: I don’t think the owner, Casey, has much to worry about walking with her pal through the city! As I often do for such sessions, I had the owner meet me outside with the dog on a leash in neutral territory. 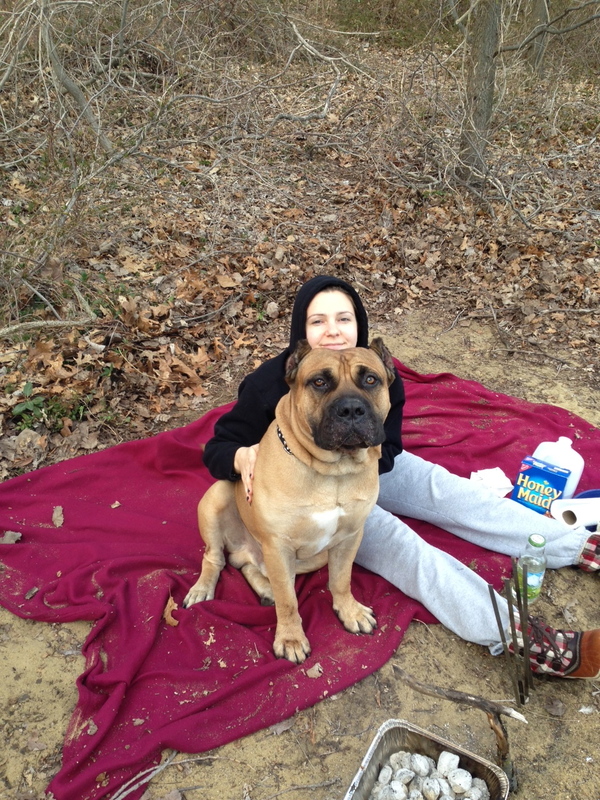 As soon as we started walking side-by-side, however, I saw instantly what a giant sweetie Tyson was. I took the leash, and as we walked he sniffed me and I rubbed his scruff. After a few attempts to dominantly mount my leg (I stepped forward, then rewarded him when he backed off and sat calmly and submissively), we gained a nice balance of trust and respect, and went off to work. Tyson was a super-quick learner! We practiced loose-leash walking; then passing, pack-walking near, and calmly meeting other dogs; then basic obedience and patience exercises like “place”, down/stay, and release around city distractions. After a good 20 minute walk to a much more isolated section of the bay, we entered a tennis court to practice offleash heeling and recall (“come”). We practiced a joyous “fetch” routine: throw the ball, he runs and grabs it, “Come Tyson!”, he comes running, “Drop it!”, treat/praise/pet…repeat. Exhausting, fulfilling, fun, bonding and educational leadership: what could be better? All three of us were panting and smiling. I told Casey to continue while I sat on the sidelines and wrote a list of homework exercises for her to practice after I left. After a minute I heard Casey shout, “What do I do?” I looked up and saw Tyson with his jaw wide open, looking like he was trying to cough. I jumped up and ran over, looked inside his mouth and saw the ball, halfway down Tyson’s throat. I reached in, but between Tyson’s bite reflex and the distance the ball had descen ded, I couldn’t grab hold. He was retching more violently now, starting to foam at the mouth, walking backward as if trying to walk away from the ball. We were at least a half a mile from cars or other people, so there was no time to get him help. We had to help him right then and there. I grabbed all 114 pounds of him and did the doggy-Heimlich from two different positions. Both were, as I feared, ineffective, as Tyson was just too heavy and the ball was too firmly wedged. When I set him down, he collapsed onto his side. His eyes were bulging. I tried to dislodge the ball – but have you ever tried to grab something out of the sink or from under the couch, and when you make a fist to pull it out, your hand won’t fit back out? I knew we had minutes to spare, at most. Time stood still. I was sweating, praying, and, though I hadn’t realized it, I was bleeding fairly seriously as a result of one of Tyson’s bites. Casey was weeping: “I think he’s dead!” He had evacuated his bowels, and hadn’t breathed for minutes. He’d stopped biting me. His eyes stared straight ahead, straight into mine, mere inches away. I started doing “mouth-to-snout” resuscitation, filling my lungs and then Tyson’s, again and again. It gave me hope to see his chest swell as I tried to breathe my life into him. I would do three deep breaths, then chest compressions; then dig again at the ball, from inside as well as pressing on his throat from the outside, trying to squeeze the ball out like toothpaste from a tube. Deep breath; mouth-to-nose; chest compressions; dig and squeeze. After what was probably another minute, but seemed like an hour, the ball rolled…and popped loose. But Tyson still lay motionless. I pulled his tongue from his throat, making sure the airway was clear, and kept doing the CPR. Deep breath. Blow. Compressions. Please, please give me a sign. Breathe. Move. Anything. I thought I saw an eyelid blink. Can blinking be a reflex, I wondered? Can you blink if you’re dead? I kept working – and then saw both eyes blink. I paused, felt Tyson’s nose. I felt a shallow breath of warm air on my frozen fingers. It was the most beautiful breath I’ve ever felt. I held my own breath, waiting to feel it again. He coughed, and let out an even bigger, fuller breath. And another. I sat back on my heels, let out my own breath; the world rushed into my senses again; I remembered where I was. Tyson was still too tired to lift his head. But his eyes peered around, searching for his mommy; finding her, and relaxing back in comfort. My eyes found Casey’s as well: too much emotion to speak. We sat there in the gently falling snow for a few minutes, on opposite sides of Tyson’s head, hunching over it as if kindling a fire. All three of us panting; two of us wiping our eyes, smiling from the pure release of stress, petting and talking nonsense in low tones to the dog. “How’s it going boy?” I asked, and scrubbed Tyson’s chin. He sat up. Those eyes still staring into mine, as they’d been the whole time, he gave me a big, wet, sloppy kiss, right on the lips. Testing him, I got to my feet, and he followed. After a few wobbly steps he seemed right back to his goofy self. We knew he was okay when he bristled up at a passing dog, and pulled on the leash to chase a few birds. I walked Casey and Tyson home; and though it was difficult for me to say goodbye after all that had happened, Casey promised to take Tyson to the vet asap and I headed to the ER myself. I got the typical antibiotics and a few stitches in my hand; one of Tyson’s involuntary bites had severed some nerves in one of my fingers, but after some investigation the doctors determined there was no damage to the tendons. I’m not a stranger to the ER for dog bites, but this is the first time it had been for a good, positive, heartwarming reason. The doctors spread the story around the ER. “It’s not often we hear a happy ending like that in here,” said one. Casey thoughtfully texted me later to check up on me; then again the next day to say that the vet had given Tyson a clean bill of health. …but only one is squishy. There are two big lessons I’m taking away from the day, that I want to spread here in case they help anyone avoid such a situation in the future. First of all, avoid playing with balls that can fit down the throat. We hear lots about the dangers of rawhides and chews, but balls and toys can be just as dangerous. And it may make things worse if the ball or toy is incompressible. The combination of not-quite-swallowable and too-rigid can create a perfect storm of Fetch. Even when using the common tennis ball, take care when playing with dogs with large heads, throats, or appetites. The second lesson I want to impart is how important it is to read, learn, and practice CPR. Just reading the basics, even once, will leave something in the back of your mind that someday – hopefully never, but you never know – might help you save a life. For the basics, look for “CPR” or “emergency care” on any reliable website like ASPCA.org or petmd.com. In my hometown you can attend seminars and workshops on pet CPR offered by Brooklyn Bark dog walkers. After my stitches come out, the scar fades, and the numbness in my finger becomes second nature, I’ll still think of you Tyson. I’m going to remember that day, and those eyes, for a long, long time.